BEND, OR -- President Donald Trump is praising passage of the Republican tax reform bill, while charities worry how it will impact their bottom lines. The National Council of Nonprofits estimates private giving could decrease up to 5% because the bill doubles the standard deduction and takes away the need to itemize returns. Janet Huerta is the Executive Director of Bend-based Saving Grace, which helps victims of domestic abuse and assault. She's concerned it could effect both private and corporate donations. "The problem, of course, is that the tax break for giving just isn’t there. A lot of times, business giving – there’s a philanthropic motive, but there’s also a business motive because you know you’re going to get a break on the taxes. And so, if you take that tax break away, part of the motivation for giving goes away." Huerta tells KBND News the tax savings for top earners are not likely to benefit her local organization. "Lots of studies have shown that the people who are actually most charitable are the people who are lower income folks; in terms of a real percentage of income, they actually give more. The ultra-ultra rich give very little, in proportion. Will businesses increase giving? I don’t know; that’s hard to say. That would be a good thing if that were to happen." She says she’s worked for years to diversify how Saving Grace brings in funds, however federal grants have decreased in the past 12 months, further eroding revenue sources and increasing reliance on foundations and other local donors. About a third of Saving Grace’s $1.8 million annual budget is private donations. Huerta is taking a wait and see approach as she develops her 2018 budget. "Normally, I try to increase the amount I have budgeted for individual gifts, year over year; just a little bit, you know. But, [I’m] not doing that next year, not really counting on that and just sort of seeing how that goes." 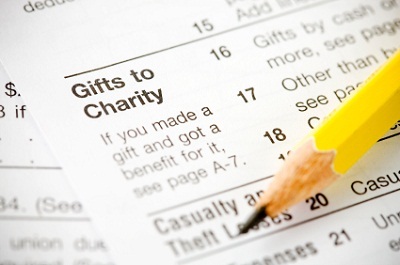 Some financial experts suggest making a donation before January first, to insure the tax deduction.